Charter Oak® vinyl siding from Alside® provides maximum energy efficiency that ultimately saves you money and time, while keeping your home comfortable and quieter year-round. 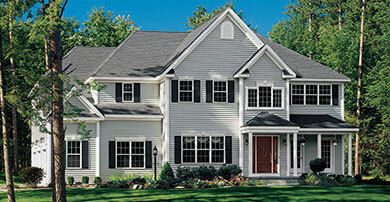 It’s reinforced siding with a luxurious appearance of freshly painted wood, handsome shadow lines and refined quality. The inside of your home will be cooler in summer, warmer in winter and quieter year-round with Charter Oak insulated siding. Charter Oak is manufactured with Fullback®, a precisely contoured insulating foam underlayment that provides all the benefits of premium vinyl siding. This innovative contoured foam underlayment makes Charter Oak stronger and more impact-resistant while also providing a protective thermal barrier with greater insulating power. From the very first glance, you’ll appreciate the exceptional craftsmanship of Charter Oak. Charter Oak siding comes in different finishes, from a smooth finish that looks just like freshly painted wood to oak grain finish that shows the true texture of real oak wood. Quality Home Exteriors provides expert installation of Charter Oak siding and many other quality siding products from Alside. Let’s discuss how we can give your home better protection and greater curb appeal. Call us at (402) 403-5815 or fill out our appointment form today.